The MMO genre is one that I’ve grown fond of over the years, though the only two I currently play much are The Elder Scrolls Online and Final Fantasy XIV: A Realm Reborn, after a rather lengthy hiatus following my departure from World of Warcraft. An MMO being released is generally a big deal—they’re often hard to miss, either from advertising or simple word of mouth. That, for me, is what made my discovery of Onigiri somewhat interesting. It was developed by CyberStep and, I was surprised to discover, was released two years ago in Japan. Yet it didn’t get a North American release until October 2015, and that release had, as far as I could tell, relatively little fanfare. This free-to-play action MMO simply appeared in the PlayStation Store one day, and I couldn’t help but be curious. The setting seemed like an interesting one. Oftentimes, MMOs seems to go for the “medieval fantasy” setting, which I find absolutely nothing wrong with, personally. But an MMO with a more Japanese-inspired setting was something I hadn’t seen before, though I had my hesitations. When going into a game, I generally try to keep a neutral stance on it and keep any preconceived notions to a minimum. 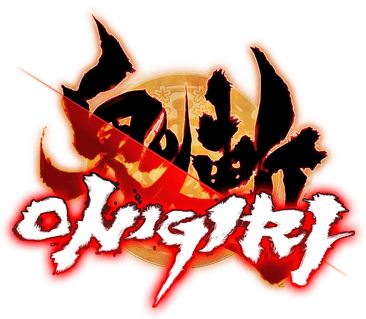 This was another way that my experience Onigiri was different: I honestly expected this game to be terrible, but I was willing to try it. After all, it was free to download and free to play, so what did I have to lose? What I found is that the game is a mixed bag. As I mentioned earlier, the setting itself is incredibly refreshing, taking place is an alternate version of Japan, where all the strange spirits and monsters from Japanese mythology are alive and very real and a normal part of the world. Prior the game’s beginning, the Kamigui (the more villainous demons and spirits) were wreaking havoc and destruction over the land but were stopped by Amaterasu Oomikami, the goddess of the sun, by placing three great seals. However, the threat returns when one of the seals is broken. The player takes the role of an unassuming Oni, whose life changes when the Kamigui return and who now plays a role in stopping them again. It’s par for the course when it comes to the plot of an MMO, so if you’re looking a completely original MMO plot, this would hardly be the one. The game does have some decent character-creation options. The setting itself, however, is surprisingly charming despite the game being on the low end of the graphics spectrum. In a lot of ways, it goes far below what other low-end MMOs are capable of. A lot of the designs are rather plain, with a lot of rather drab and dull colors, even when you head out into the wilderness and out of the central hub area. Yet, oddly enough, all the characters are incredibly vibrant and colorful, and the designs are incredibly unique and entertaining. The various quest NPCs and the enemies that populate the world are, like the player, well-established monsters, demons, and ghosts from Japanese folklore. One of the many interesting NPCs you encounter. But then there’s the real heart of the matter: how does the game play? Obviously, being an action MMORPG, combat plays a major role in the game. The combat system is much simpler in comparison to other MMORPGs and is actually the strongest aspect of the game. There’s not the expansive UI seen in most other games—it’s a fairly simplistic and straightforward combat system, and it’s a very fast-paced one as well. That said, it doesn’t allow the most freedom or variety with it, often going with the standard array of weapons (two-handed weapons, single-handed weapons, dual-wielding, and staves for magic users). There is no inherent class system within the game; it simply matters which weapon you decide to use, and you can change that at any time. With each weapon, though, there are different skills you will learn and improve with each weapon type. Fighting Kappa and other monsters is incredibly fun. The game naturally features dungeons as well, which are repeatable. However, they work slightly differently in comparison to other games in that Onigiri dungeons have different difficulty levels. There are three levels to each dungeon, each one with a recommended level: Normal, Hard, and Hell. They are easily run solo, as long as you’re at the recommend level, though there is a noticeable increase in the strength of the monsters which each increase in difficulty. An interesting feature in Onigiri that I’ve personally never seen an in an MMORPG before is some mild dating-sim elements. You gain several different companions to join you on the main quest, each with their own affection meter, which is essentially how you level them up. This can be increased by doing things such as giving them gifts. Each companion has their own likes, and so you’ll have more success by giving them certain items as gifts as opposed to others. So, naturally, giving them an item they like will give them more experience and level them up much more quickly as opposed to a neutral item. As far as MMOs go, Onigiri is not one I’d rate very highly in the end. It certainly has a lot of charm to it, and a solid combat system that is simple yet manages to be fun and exciting. For a game that costs nothing to own and nothing to play, it’s one of the better ones. The character designs are interesting and unique and it has a setting far different from other MMORPGs on the market. However, in the end, it just does not come across as engaging and immersive as The Elder Scrolls Online or Final Fantasy XIV or World of Warcraft. MMOs are strange to judge, as they are constantly evolving and changing. In a way, you invest for the future, to some extent. Perhaps years down the road, Onigiri will evolve into something more, but all the same, for all it got right, there are still better ones out there. Alex is a graduate of St. Cloud State University, where he majored in creative writing. He's a voracious consumer of high-fantasy and sword-and-sorcery stories, be it through games, novels, films, or TV. He's also a longtime player of video games and has a strong affinity for story-driven games.